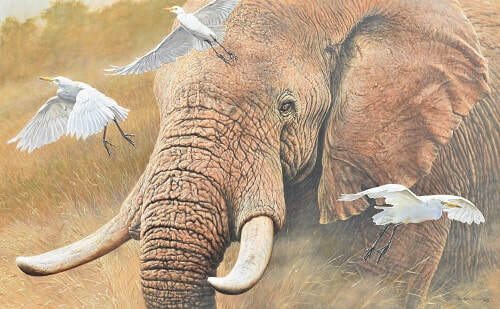 The elephant is the largest living land mammal. Of all its specialized features, the muscular trunk is perhaps the most extraordinary. It serves as a nose, hand, extra foot, signaling device and tool for gathering food, siphoning water, dusting, and digging. 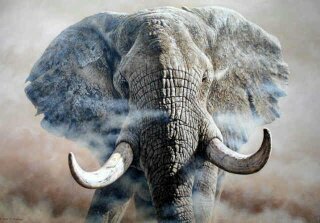 The tusks are another notable feature of both males and females. 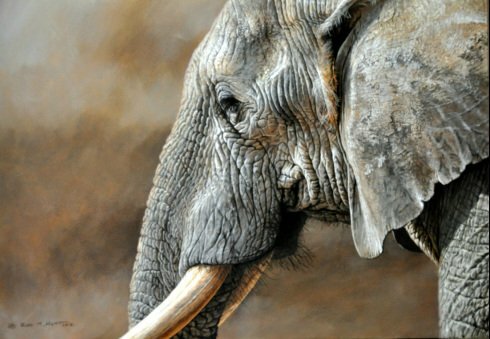 Elephants are right or left-tusked, using the favored tusk more often, thus shortening it from constant wear. Tusks differ in size, shape and angle and researchers can use them to identify individuals. Usually only one calf is born to a pregnant female. An orphaned calf will usually be adopted by one of the family's lactating females or suckled by various females. Elephants are very attentive mothers, and because most elephant behavior has to be learned, they keep their offspring with them for many years. Tusks erupt at 16 months but do not show externally until 30 months. The calf suckles with its mouth (the trunk is held over its head); when its tusks are 5 or 6 inches long, they begin to disturb the mother and she weans it. Once weaned usually at age 4 or 5, the calf still remains in the maternal group. Elephants consume about 5% of their body weight and drink 30-50 gallons of water per day. Young elephants must learn how to draw water up their trunks and pour it into their mouths. They eat an extremely varied vegetarian diet including grass, leaves, twigs, bark, fruit and seed pods. Today, it is difficult for elephants to live outside protected parks as they are pressured by poachers and by the habitat loss that comes with increasing human settlement. For more than 45 years, AWF has been involved with elephant research in eastern and southern Africa, developing management strategies to minimize human-elephant conflict. Elephants are an essential component of African ecosystems, but when they are confined by park boundaries and human settlements, their impact can upset the ecological balance. Thus, the identification and protection of migration corridors and dispersal areas outside of parks is critical. Elephants are gregarious and form small family groups consisting of an older matriarch and several generations of relatives. These family groups are often visited by mature males, who check for females in estrus. Several interrelated family groups may inhabit an area and know each other well. When they meet at watering holes and feeding places, they greet each other affectionately. Smell is the most highly developed sense, but sound deep growling or rumbling noises is the principle means of communication. Some researchers think that each individual has its signature growl by which it can be distinguished. Sometimes elephants communicate with an ear-splitting blast when in danger or alarmed, causing others to form a protective circle around the younger members of the family group. Elephants make low-frequency calls, many of which, though loud, are too low for humans to hear. These sounds allow elephants to communicate with one another at distances of five or six miles. Just like small children, baby elephants love mud and water and these two orphans rescued by Daphne Sheldrick are no exception. Watching these animals enjoy themselves after they had seen their mothers die needlessly and been so close to death themselves is truly heart-warming!